Yep, you can now compile a native OS X app of your p+ project! Can release things to the new Mac App Store.. not Dink because of problems with in-game DMOD downloading and their submission rules, but other things. Can create Mac versions of my ludumdare 48 entries to allow more people to play it. Yeah, LD is almost here already and I hope to be able to participate. It looked a bit too hacky to try to support OS X and iOS builds in the same xCode project so I did them separately – but because you can drag and drop project items between them it’s very quick to setup. I’ve added OS X xCode projects in the OSX subdir of RTSimpleApp and RTBareBones on svn. 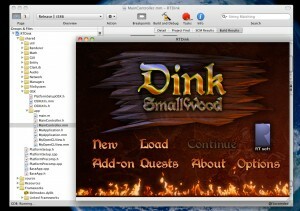 This entry was posted in Development/RTsoft, Dink Smallwood, Proton SDK on December 14, 2010 by Seth.